Today, there are many different types of rubber material that can be utilized to enhance your product or application. The actual characteristics and properties the synthetic rubber material adopts will greatly depend on the chemicals used in production. These characteristics come directly from the chemicals used. As a result, different elastomer types can range from being as hard as softball or soft as a pillow. Because of this, it’s vital you choose the best types of rubber materials to bolster the performance of your product or application. Since no one expects you to understand all of the rubber elastomers and their characteristics, the custom manufacturing team at Frank Lowe is here to help. Since 1955, we’ve helped manufacturers and business owners explore, pursue and create better products and solutions with our range of rubber elastomer types. Let’s take a quick look at some of the most common types of rubber materials we die cut and fabricate at Frank Lowe. Neoprene or Chloroprene Rubber was one of the first oil-resistant synthetic rubbers.This type of rubber is moderately resistant to ozone, oxygen, UV, and petroleum. It’s classified as a general purpose elastomer that has good abrasion, resilience, and a low compression set. This material is also flex-cracking resistant. These qualities make neoprene ideal for sealing applications where other types of rubber wouldn’t suffice. Silicone is one of the different types of rubber that retains good elastomeric properties at both high and low temperatures. It’s a highly customizable product that can be formulated to meet a range of different specifications. Ethylene Propylene Diene Monomer (EPDM) rubber possesses several characteristics of traditional rubber elastomers, such as a high tensile strength, tear resistance, and a low compression set. What sets EPDM rubber apart from other types of rubber is its ability to resist degradation from weathering agents such as ozone and UV rays. At the same time, EPDM boasts resistance to steam and polar substances. All of its desirable attributes make EPDM ideal for outdoor use as the perfect weather resistant rubber. And a range of fuels from non-aromatic to aromatic petroleum to aliphatic and aromatic hydrocarbon jet fuels. However, red rubber isn’t best suited for use with solvents, oils, fuels, or hydraulic fluids. Importantly, Viton rubber gaskets offer resistance to compression sets over extended periods of time at high temperatures. It also has good electrical properties for low-frequency, low-voltage applications. Diaphragm rubber is a fabric reinforced, oil resistant neoprene material ideally used to transmit motion between fluids. Diaphragm rubber is excellent for weather stripping material and can provide a long service life. Cloth inserted neoprene is a type of rubber compound made with one or more polyester fabric. This type of rubber can be especially helpful whenever dimensional stability is required. Cloth inserted neoprene can be used when moderate resistance to oil is necessary and in situations where cold and hot gases and water are being conveyed. 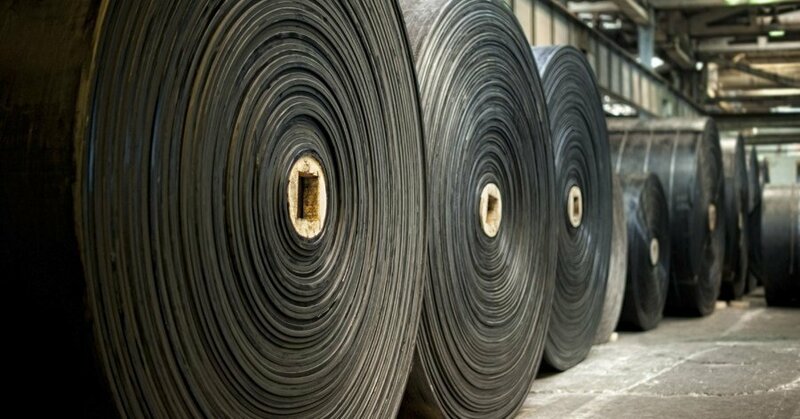 Unlike non-cloth types of rubber, the cloth will stay intact whenever compression or bolt loads are high. Cloth inserted neoprene works to reduce gasket creep and adds an enhanced level of stability. 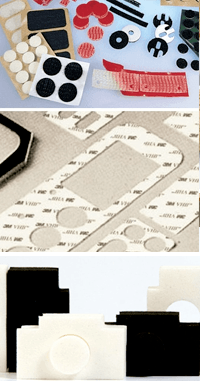 In addition to the previously mentioned different types of rubber, we also create rubber die cuts for components and applications with FDA-approved white rubber and many others. Fortunately, we don’t expect you to be an expert in the different types of rubber. Instead, we’ll use our decades of experience to guide you to the best solution based on the unique needs of your application. Simply put, we’ll get to know your application and help you explore, pursue, and create better with different types of rubber.